4 + 1 = Required Please enter the correct value. Most investors are under the impression that market timing strategies don't work. That's just what they have been told by the "experts." Investment companies like Charles Schwab advise their clients against timing the market. 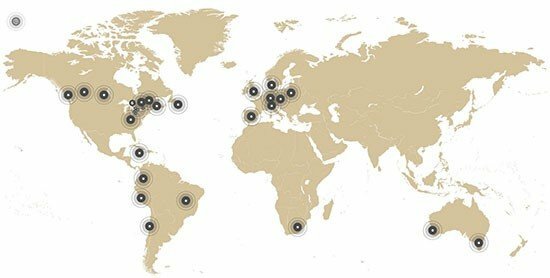 They recommend accumulating wealth by investing regularly and for the long term. When advisors refer to timing the market, they mean the market as a whole. But there are too many unexpected circumstances that arise when trying to time the entire market. When we talk about market timing, we're not talking about predicting where the market as a whole is going. Instead, we talk about timing your entry or exit of specific stocks or options. Timing individual trades is one of the fastest ways to grow your wealth in 2017. For example, Money Morning Options Trading Specialist Tom Gentile used market timing strategies just this week and produced a 100% gain in just one day. 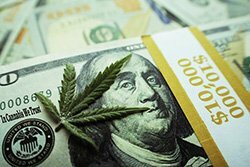 He did it by looking for buy signals of AbbVie Inc. (NYSE: ABBV). The Relative Strength Index (RSI) is the ratio of higher closing prices to lower closing prices of a stock. It measures the momentum of a stock price's current trend. The momentum of a stock's trend lets you know if it will continue on its current path or reverse. This insight allows you to get in and out of trades ahead of the trend for larger profits. The calculation usually uses the past 14 closes, but that number can be changed to make it more or less sensitive to market fluctuations. The best time to use RSI is in a sideways trend. In a trend where the price of a stock is staying relatively static, RSI can tell you when the price should start to rise or fall. 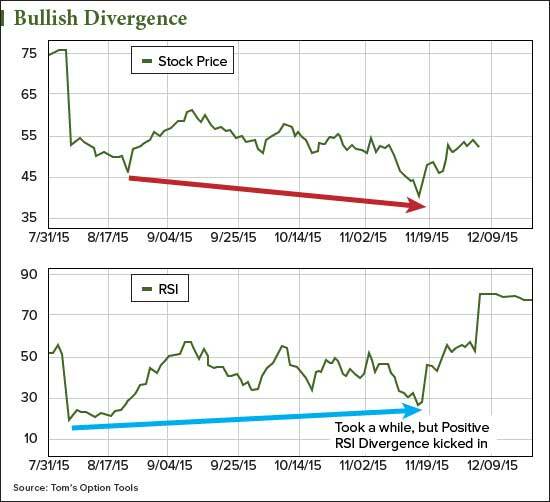 There are two types of trends to watch with RSI: divergence and failure swings. Divergence is when the stock price and the relative strength index do not match. A bullish divergence is when the stock price makes a lower low price then the RSI shows it should. RSI may still be in the oversold zone (as the example below), but it is not trending as low as the price of the stock is going. This indicates that the trend is gaining steam. For example, the "stock price" chart below shows the stock is breaking out of a downward trend. The "RSI" chart below shows the stock price should not have gone as low as it did at the lowest point, displaying a strengthening up trend. A bearish divergence is when the stock price makes a higher high price than the RSI shows should be possible. This is an indication that the trend is losing steam. In the charts above you can see the overall downward trend of the stock price as the RSI is low. As the RSI rises, the stock price rises as well. Since a stock can stay in an overbought or oversold zone for an extended period of time, it's best to try and initiate trades when the momentum indicator is breaking out of these zones. Consider a bullish trade when the RSI comes out of an oversold zone. A great bullish trade is to buy calls or LEAPS of a stock that is emerging from the oversold zone. Consider a bearish trade when the RSI comes out of an overbought zone. An example of a bearish trade to enter is to buy puts or short calls. The second trend to watch with RSI is failure swings. A failure swing is a strong indication that a current trend is about to reverse. These occur when the relative strength index is in an overbought or oversold zone. One thing to note is that you are not looking for a price deviation. The RSI pattern is the focus of this market timing strategy. The RSI comes out of the overbought zone by dropping below the 70 line. Then it retraces back up and holds at or below the 70 line. RSI will fail to reach the same level that it did before. Finally, it will break down below the recent RSI low. The RSI comes out of the oversold zone by rising above the 30 line. Then it retraces back to and holds at or above the 30 line. RSI will fail to reach the same level as it did before and turn back up. Finally, the RSI will break above its recent high. Using RSI, the best time to buy a stock or call option is at the failure swing point of a bullish failure swing. This will allow you to confirm the trend is reversing and ride the upward momentum. 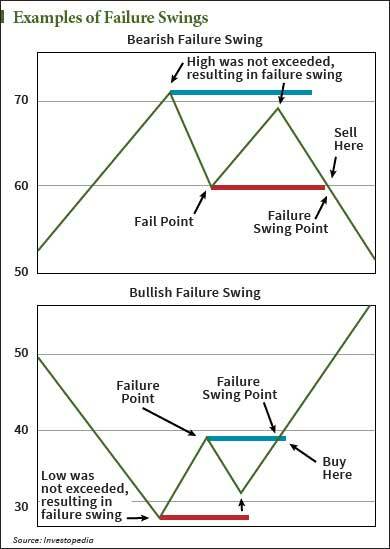 Conversely, the failure swing point of a bearish failure swing is a great time to sell a stock or buy put options. This will allow you to be certain the stock has reached its peak before you cash in or ride the down swing. The RSI chart below is for SolarCity Corp. (Nasdaq: SCTY) from October 2015 through December 2015. SCTY went into the oversold zone Oct. 30, 2015. Based on the advice above, we would not want to buy the stock since there is no way of knowing how long SolarCity would stay in the oversold zone. On Nov. 20, 2015, SCTY came out of the oversold zone, and we would buy the stock. That day it closed at $29.04. Fast-forward to December 2015 and you can see SolarCity entering an overbought zone. It fully entered the zone on Dec. 16, and we would sell the stock. That day SCTY closed at $56.91. Following the RSI indicators for SolarCity would have made you a profit of 49% in just under a month. That is an annualized return of 588%. The annualized return is not your actual return, but a way to compare trades with differing time frames. The Bottom Line: The Relative Strength Index is a measure of momentum. Divergence and failure swings are two market timing strategies that use the RSI. 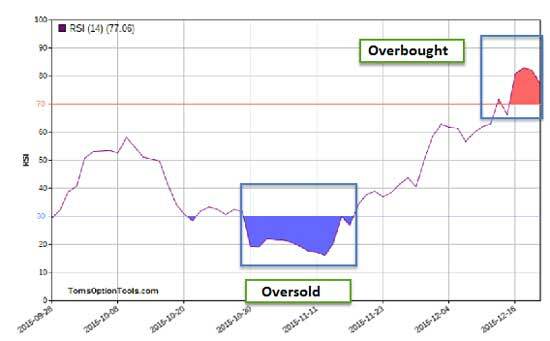 By buying stock or call options when a stock leaves the oversold zone and selling those positions when the stock enters the overbought zone, you can make large profits quickly. Up Next: Timing the market is just one component of options trading. We compiled a complete guide to get you options trading like a pro in 2017.